Our older daughter has always had a knack for drawing, did quite a bit when she was younger, and has a particular knack for cartoons. The drawing below, which was created when she was about twelve, has always been my favorite because it elicits, for me, a moment and a very particular feeling. Is it not one of the motivations of art to transport the viewer to a time, a place, or an emotion? We store these data in our heads and call them memory. Just as data is stored it is also retrieved. I wonder what initiates the recall of any particular piece of data from its register and into consciousness? Is it possible that sculpture, painting, the written word, or perhaps a concerto can motivate remembrance? I believe they can. 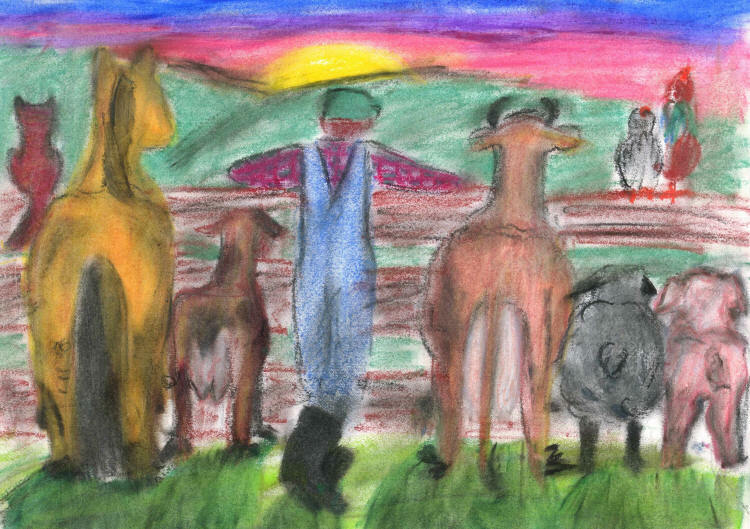 For me, this drawing reminds me of times when the day’s work was done and I have been able to spend a minute or two enjoying the sights, sounds, and smells of the farm. Admittedly those times have been few and far between – but they happen, and when they do they have been as colorful as the image.